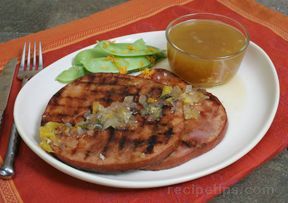 RecipeTips.com's video demonstration, 'How to Bake a Ham,' is an easy-to-follow guide for preparing baked ham that can be used for a number of ham recipes, such as baked ham with cloves and honey baked ham. Hi! 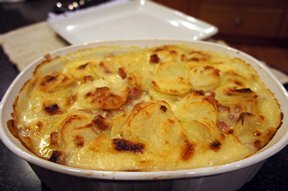 This Laurie from RecipeTips.com, and today I am going to show you how to bake a ham. 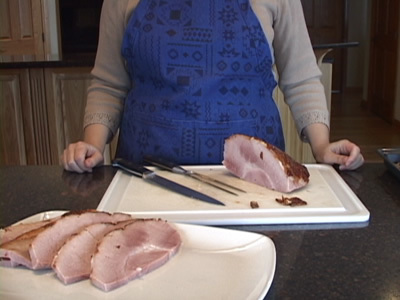 You want to start by laying your ham on a flat surface, such as a cutting board. 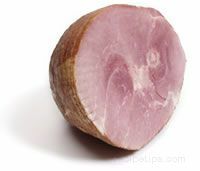 Then you are going to start by diagonally cutting the ham, not very deep, maybe about an eighth of an inch, all the way across the ham, and what this is going to do is allow us to add cloves and allow the glaze and the seasonings to be soaked into the ham. 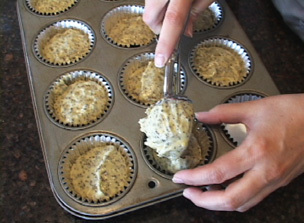 When you get one side done, you want to turn the ham and go the opposite direction. This is going to make diamond patterns in the ham. Next we are going to find the center of our diamond where the crisscrosses meet, and just gently place a clove into each section. 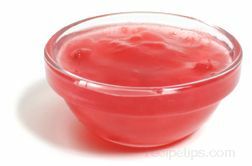 After you finish scoring your ham and placing the cloves, you want to preheat your oven to 325 degrees Fahrenheit. Place your ham cut side down into a roasting pan. It is important to have a roasting pan that has a roasting rack included so the ham does not sit in its juices while it is cooking. 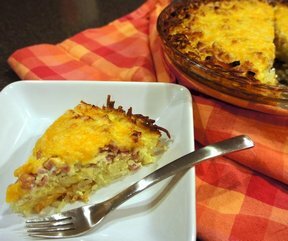 Plus, it is easier to remove the ham when it is done in the oven. This is a 10-pound fully cooked bone-in half ham. 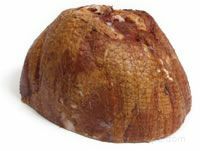 We will want to bake this ham for 18 to 24 minutes per pound or until the internal temperature reaches 135 degrees Fahrenheit. At that point, we will remove the ham from the oven and allow it to rest for approximately 15 minutes. This will raise the temperature 5 to 10 degrees and will bring it to at least a safe temperature of 140 degrees Fahrenheit. 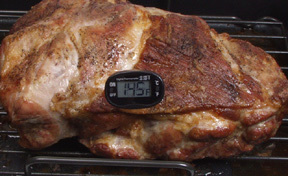 Once your oven has preheated to 325 degrees Fahrenheit, place the ham in the oven on a lower rack, and set your timer for the proper cooking time. Remember that every oven cooks differently. 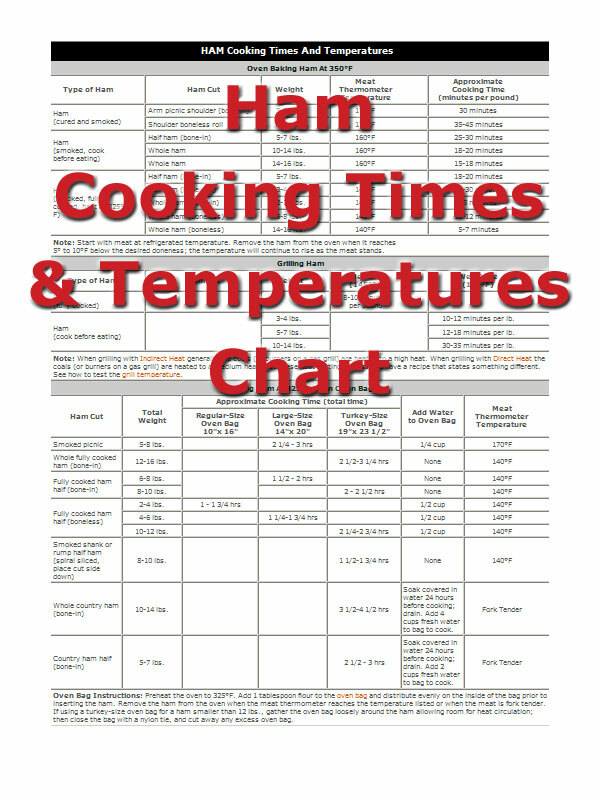 Go ahead and check internal temperature of the ham 45 minutes before it is supposed to be done just to make sure you are on track. Then go ahead and baste your ham every 10 minutes for the last 30 minutes of cooking time. Remove your ham from the oven and tent loosely with foil. 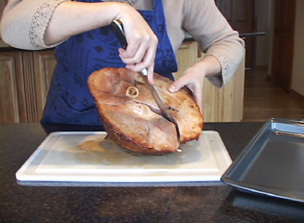 Letting the ham rest allows for the juices to redistribute throughout the ham, resulting in a firmer, juicier, and easier to carve ham.